Good pieces of jade have always been collector items for many Chinese, in particular members of the wealthy families. Jade is also considered to be a symbol of blessing, good luck, health and longevity, the names of goodies for all Chinese, and for as long as the history of their culture. Hong Kong has been a prominent centre of jade trading for many years, centering around the district of Jordan, near the then Jordan cross-harbour Ferry terminal, where some traders, mostly Chinese, from South East Asian countries eagerly made their bids and takes using ritualized hand signals hidden by the palm of their counterparts. Today the Government run Jade Market is still a major tourist attraction, where you will probably not be able to get the best bargain nor the best pieces, but certainly some good souvenirs at the right price. During recent years, the jade business has been booming in Mainland China because of the prospering economy there, driving up, in particular, the prices of the more expensive pieces. 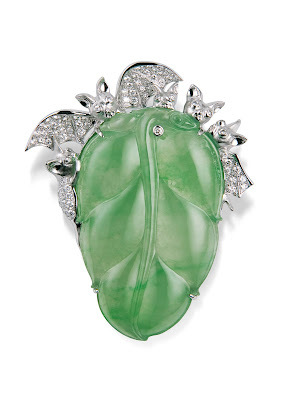 And with it comes the demand for jade jewelries with good designs. A few months ago, I was invited by a national banking corporation to give talks in Hangzhou on jade appreciation and jade design. Being rooted in Chinese culture and a jade lover since childhood, I got the benefit of having become an expert in appreciating the special greenish tones that Chinese value for the stone, as well as creating jewelries that respect and enhance the traditional jade culture for my customers. Sometimes my work, like the jade pendant below, will develop from a cultural theme that touches the heart of Chinese. And in all cases, I will put the piece of jade as the focal point, with my design enhancing the value of the stone, as well as giving it a modern look grounded in rich cultural soil. The value of the materials added (precious metals, like 18K gold, and precious gem-stones, usually point-size diamonds) will also need to match the value of the jade piece itself, so as not to overshadow or undercut the value of the centre piece. Only by respecting culture, can a designer truly make an old tradition alive.